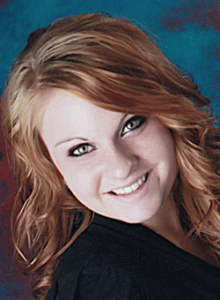 Randi Schrage of Neligh and a graduate of Pope John XXIII Central Catholic High School, won a Judge’s Special Citation and a Gold award in the Nebraska ADDY competition in the category of Out-of-Home – Single. Creative Center (CC) students won 22 awards at this year’s Nebraska ADDY Student Competition, sponsored by the American Advertising Federation. Students entered original creative projects into competitive categories which were judged by area professionals. Locally, projects are judged by area professionals. Local winners advance to one of 15 district competitions. The Creative Center is a college of art and design in Omaha, Nebraska offering a three-year Bachelor of Fine Arts degree in Graphic Design, and a two-year Associate of Occupational Studies degree in Graphic Design. Students attend class Monday through Friday from 8:30 – 3:30 and learn multiple aspects of graphic design. Every student receives a Mac laptop computer and software (to keep!) as a part of the tuition and fees, and gets plenty of chances to use it exploring as many of the computerized visual realms as possible, from branding to web design, from package design to multimedia, and from advertising to illustration. For more information on the Creative Center, visit our website at www.creativecenter.edu <http://www.creativecenter.edu> or call us toll free at 888-898-1789 or locally at 402-898-1000. See complete list of award winners below along with the high school from which they graduated.